One of our first designs and still the best selling pistol silencer ever, the Osprey™ is the lightest, quietest, and only multi-caliber polygonal centerfire pistol silencer on the market. 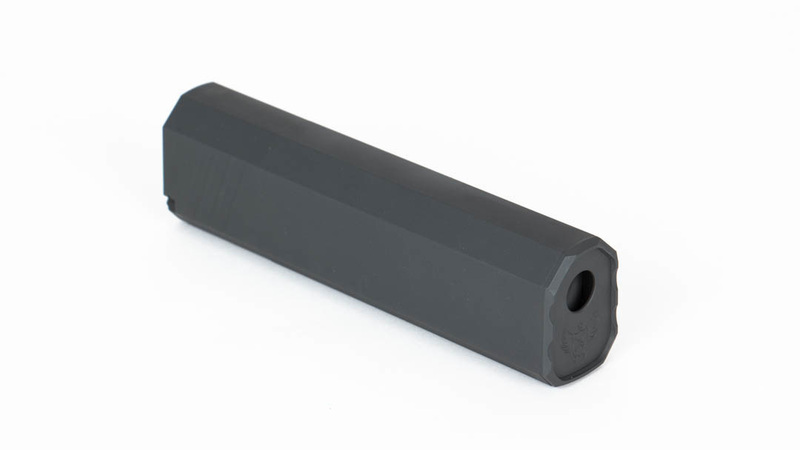 The revolutionary eccentric, monocore baffle design increases internal volume below the bore line, therefore increasing sound suppression without blocking standard pistol sights. The Osprey uses a patented cam locking system, which indexes the silencer to the correct position, even after being removed and reattached to the host. In addition, the Osprey can be used with 300 Blackout subsonic rifle ammunition. Caliber: 9mm, 40S&W, 45ACP & 300 BLK Subsonic. Muzzle Average dB: 9mm: 135.0 dB .40 S&W: 135.8 dB .45 ACP: 137.3 dB Weight: 8.0 oz. Length: 6.41”. Diameter: 1.30×1.75”. Materials: Aluminum & Stainless Steel.